Charlotte Sound in one day – by sea and land. This is a single direction adventure, starting from Picton you paddle to Mistletoe Bay, leave your kayak, and walk or ride from Mistletoe Bay to Anakiwa. Riding/walking from Mistletoe Bay means that, once you have reached the track out of Mistletoe Bay, you are predominantly riding/walking downhill. A much better way to travel! The morning sea kayak trip paddles from the Picton harbour and into the Grove Arm. After stopping for morning tea, you cross the Sound to the head of Onahau Bay where your guide farewells you and you paddle on your own to Mistletoe Bay (at the head of Onahau Bay). 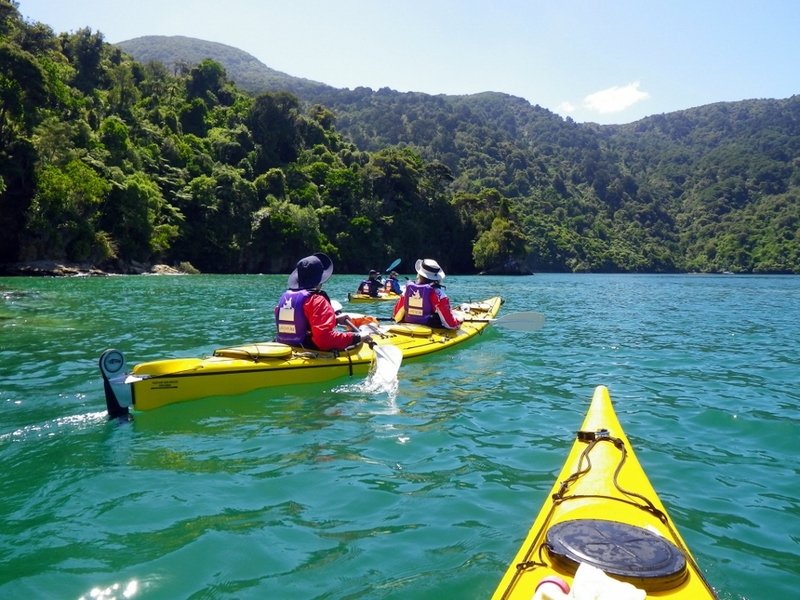 Drop your kayak at the jetty and join the Queen Charlotte Track for a 12.5 km hike or mountain bike. 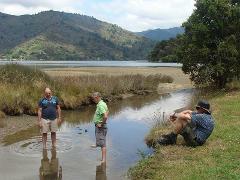 From Mistletoe Bay it is a steady ride to the top of the hill to join the Queen Charlotte Track. 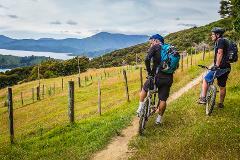 The track sidles around the eastern side of Onahau Bay and the views are stunning as you look back along Queen Charlotte Sound. The track then follows the Grove Arm foreshore through stunning native beech forest on a gradual decline to Anakiwa, where the water taxi picks you up an takes you back to Picton. Please note that the afternoon walk or bike is not guided and you are responsible for yourself for the rest of this trip. recommended to enjoy this trip. Warm wool or fibrepile jersey or jacket – not cotton. Full amount will be charged if client fails to cancel trip by 7.00am on morning of departure. We require a credit card number to confirm your booking. A deposit will not be debited from your card, as full payment can be made at our office upon departure. Cancellation must be received by 7.00am on the morning of departure or full trip value, per person, will be debited from your card. I have never kayaked before, can I still do this trip? Yes, many of our clients have never sea kayaked before but find it really easy to do. I can’t swim, will I be okay? Yes, you will be wearing a buoyancy aid and you will be travelling in a party with a guide, so the chances of you capsizing and falling out of your boat are minimal. Your guide will have provided you with a briefing on what to do if you do capsize. If you are unsure about biking or walking on your own, then this may not be the best option for you. However, this section of the track that you will be walking/biking on is achievable for most people to enjoy independently. It is one of the more popular sections due to the terrain being easier to walk/ride. I haven't done much mountain biking before - is this option suitable for me? 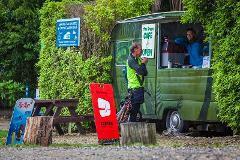 This section of the track is the easiest to mountain bike (compared to the rest of the track) but is still a single track which means that it is narrow in parts, and does have steep drop-offs so caution is required at all times. The surface can be slippery if there has been rain, and there are some rocks and tree roots also. If you haven't mountain biked before, then we would not recommend this option. Will I be back in time to catch a ferry or bus? Your water taxi returns you to Picton around 4.30pm. So there is time to catch the 6.00pm ferry to Wellington if required. I need to be fit to enjoy this trip? We recommend that you are at least of average fitness to enjoy this trip. You may feel a little tired in your shoulders after a day’s paddling, but we do have stops along the way and the pace is gentle. What if it gets windy when I am out there? Our trips are flexible enough that we can change the itinerary to meet the weather conditions. Ideally we try to organise the day so that the wind is at your back as much as possible. However, as with any outdoors experience, there may be times when you are required to paddle in windy conditions. If this is the case, then we try to minimise the time that you will be paddling into the wind.